The giant gods of the ancient world and the successors they choose created mind-sets that shackle us to short desperate lives. These so-called gods rocketed to Earth from a planet they called Nibiru. Nibirans stand way taller and live way longer than we. The ET Nibirans said they bred us as short-term slaves and soldiers. We killed in their names: Allah (= Sumerian, Marduk or Nannar), Yahweh (sometimes = Enlil, at times Adad or even Enki), Ishtar (Inanna) and Adanoi (Enki)–mining expedition personnel all, all Nibirans. We Hybrids are one species, designed to slave in mines, armies, businesses, schools, governments, farms, factories, brothels and building projects for ETs and the “royal” lines of ever-murderous hybrid rulers they begat. The alternative history Zecharia Sitchin, Neal Freer, Michael Tellinger, Andy Lloyd, Lloyd Pye, Michael Cremo and Richard Thompson articulate about our origins and development shatter the fetters of the lies with which the elite the false gods chose keep us in war, greed, poverty, shortened lives. Lies of church and state now hide information, necessities and survival plans as Earth faces immediate danger from space debris. We feel our oneness with all people and together survive when we see we’re all kin, descended from the same ancestors, ancestors from two different planets. When we accept our hybrid origins, we can nullify what the elites the Nibirans imposed on us demand. We can instead cooperate with all and drop the hate for others which the gods scripted on us. We survive together when we jointly plan for the periodic return of Nibiru, its astronauts, and the debris that lurks at its Lagrange point, 180 degrees from Nibiru on its orbit around its subdwarf primary star, Nemesis. When I studied for my doctorate in anthropology at U.C.L.A. in the 60s, my professors taught that gradual physical then socio-cultural evolution caused all human development. In physical evolution, they said a short-armed Miocene or Pliocene anthropoid primate—the missing evolutionary link that was never found because their was such link– evolved into a hominid, Homo Erectus, which in turn had evolved from simpler primates over millions of years. My anthropology teachers said Homo Sapiens–that’s us–gradually evolved from Neanderthal [Clark, D., W., 1959, History of the Primates:178]. Socioculturally, anthropologists said we evolved with technology we ourselves developed. They thought we proliferated as we planted and bred cereals from local grains, tamed indigenous wild sheep, goats, cattle, donkeys and horses, invented tools and machines, developed writing, medicine, constructed irrigation and transportation systems, built cities and developed ever-more effective mathematics, astronomy, chemistry, metallurgy, architecture and engineering. Modern information proves the anthropologists wrong about our physical evolution. We didn’t evolve incrementally from simpler primates on Earth. We’ve found no gradually intermediate skeletons of primates that link modern humans from tarsier-like ancestors from which Twentieth Century anthropologists thought we evolved. Several advanced hominids co-existed with Erectus. Neanderthal and its contemporaries, Cremo suggests, may have been survivors of astronomically-caused extinction events during human settlement on Earth long before 400,000 years ago when the scientist Enki and crews of seven – twelve foot tall Homo Sapiens colonized Earth from Nibiru. Or, more likely, as Pye argues, the hominoids contemporaneous with Neanderthal and the Nibirans were seeded on Earth by terraforming ETs. In any case, we can clearly reject the view that we’re an entirely indigenous species that evolved only from simpler forms native to this planet. We can also unequivecably reject anthropologists’ old view that the technologies we modern Homo Sapiens invented caused our social evolution. We actually developed socially when the ETs gave us advanced technologies. 60s anthropologists had noted mysterious uplevelings of civilizations every 3,600 years or so, improvements ancient inhabitants of Iraq–then called Sumer–wrote that the Nibiran gods gave them. Anthropologists of the 60s believed these gods imaginary. That Sumerans and humans on every continent saw them as gods was merely a way of saying they had advanced technology and descended from the skies. But the anthropologists were indeed correct that these space travelers were particulary spiritual beings, however (as we shall see) not only fictional but patently false. Sociologist C. W. Mills showed how power elites control Earth and collaborate to perpetuate competition and war. These elites descended from the bloodline of Enki whom Sumerians said was a god, albeit a flesh-and-blood god. 300,000 years ago, Enki combined his genes with those of Neanderthal to breed goldmining slaves. 13,000 years ago, he fathered Ziasudra (Noah in The Bible), ancestor of the elite that to this day rule Earth. The elite still employ a master-slave, god-worshiper code (with them in master status and we in slave–albeit economic slave–status) to run humanity. Ziasudra’s descendants–today’s elite–passed their mandate to dictate “from Sumer through Egypt to Israel through David and the messiahs, fostered by the Essene communities in Canaan. In 2000, Cody and Robin Johnson brought me to a seminar led by Sumerian scholar, Zecharia Sitchin. Sitchin displayed evidence in clay and stone of astronomical, geological and biological knowledge Sumerians said gods gave them, knowledge our scientists only verified many millenia later. Sitchin disproved both the theistic and evolutionary dogma perpetrated by the elite. His findings and those of Lloyd Pye, solved the mysteries of missing hominid links and the periodic leaps in our social and industrial evolution. No missing physical links existed because we emerged suddenly, when Enki and his cohorts blended their genome and Neanderthal’s. 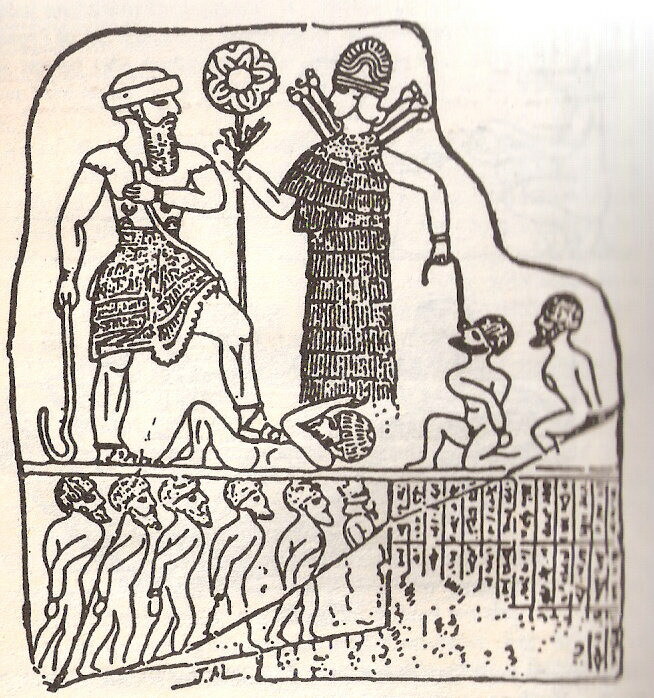 We got stronger tools and weapons when a Sumerian “god” showed the Hittites how to mine and refine iron. Sitchin’s work breaks the elite’s stranglehold on us. We attended Sitchin seminars and read everything he, Tellinger, Lloyd, Cremo and other revisionists wrote. Thanks to these revisionists, we can revise our dismissal of “myths” as superstition. Sumerians labeled Nibirans’ aircraft, submarines, helicopters, spaceships, weapons, power generators, genome splicers, healing techniques and computers with their own metaphors or words the Nibirans taught them as skyships, celestial chariots, arks, whirlbirds, brilliances, miracles and MEs. The Sumerians recorded the history and science the Nibirans taught them. We can now evaluate what these ETs said and not dismiss tales of gods as superstitious myth. In Anunnaki: Gods No More, we review our ancient history and sense of who we are, how we got here, and how the new paradigm of Hybrids’ unique two-race genetics frees us from the model the ETs imposed on us. The new view frees us the physical and economic slavery, hierarchic obsession, derogation of women, gold lust, antagonistic religions and nations the Nibirans and the hybrid elite they created dictated. Periodically I’m transported to the extraterrestrial version of the United Nations. But instead of nations we’re talking planets. So it’s the Federation of Planets, like in Star Trek where I appear and I am a representative from the planet Earth. Assembled are about 100,000 beings from all over the galaxy. There’s one representative of each sentient species present as that’s all that can fit in the venue at one time. I am called to address what it’s like to be a 21st century human female living in the country called the United States in the state of Hawaii on the planet called Earth. There are other representatives, I assume, who are called before this group, for I can only give the human female side of the equation and from the point of view of American 21st century culture and as I perceive it. I’m sure an advanced society, such as the Federation of Planets would poll opinions and perspectives from many members of a global population when evaluating something as important as the evolution of consciousness and the spiritual, political, scientific, religious and cultural progression of a society. When called to the council I am teleported to the center of a large arena where I stand in a spotlight that appears to shine from above but highlights me 360 degrees so I’m not lost in shadows. I can be clearly seen through a holographic image of myself projected to appear a few feet in front of the eyes of each individual in the arena. When I speak, I’m so close to their faces, it’s like having a one on one discussion with each other. If they speak back to me, I see them and hear them talking in my language. They sound human to my mind. Sound is not transmitted through ears but telepathically directly into the mind. I feel quite comfortable with communicating in that fashion. In fact, it feels more normal than human speech involving mouth, tongue and lips for some reason. I suspect because in most life forms telepathic communication is the norm. There’s no cross-talk, no speaking over one another. Even though many thoughts and ideas are simultaneously being communicated all around the auditorium, each conversation occurs in its own time and is understood completely by all parties talking then easily the conversation is moved to the next party until all ideas, thoughts and considerations are addressed. On the stage are three beings, all spotlighted same as I am. They appear to be sentient, bipedal forms of what appear to be large pig-like beings. But these pigs are highly intelligent, walk on two feet, stand upright and have dexterous hands, extremely coordinated. And they aren’t quite pigs. They just resemble them and I can’t explain how they look otherwise. I am in awe of them. They all have quite a commanding presence. There are two females and one male. None seem to lead. They appear to be all equal in power. They are each quite unique yet like humans, they resemble one another while having their own distinct looks and personalities. They are the only species in the meeting that has more than one of themselves present. With 100,000 beings present I’m not sure how I know that expect that concepts are conveyed to me as a whole. Language is not used, but entire concepts are conveyed to accelerate communication at what would seem like light speed to humans. We are agreed to be at this meeting such a short time, so this form of communication is the only way to complete the task at hand in time. Yet at the same time we are outside time and space, so time is not really an issue. All others have only one member of each species present. They (the pig beings) made it clear that they are in charge of only this meeting that I am attending and that leadership continually rotates. It’s a great honor to preside over the meeting and eventually all take a turn leading. None are overlooked or left out of this process. I convey to them what it’s like being me. I open up my heart and soul and they feel me, become me, merge with me and all is instantly conveyed. Many beings cry or emit sounds, convey empathy to me, fill me with love as they know in an instant what it means to be human. We humans are deemed to be the bravest of the bravest souls in existence throughout all time. We who are here in 3rd dimensional physicality have agreed to come into physical form in the densest part of existence in a grand experiment in consciousness. In order to expand consciousness we brave souls have agreed to go unconscious meaning that we are the only beings who have been disconnected from our memories, our eternal connections to GodMind, to external ONENESS, to GodSource. That level of disconnection is so painful for most beings and life forms, they experience great agony even contemplating such a thing. So the ones who are here at this meeting emphasizing with me are among the strongest of species, beings who have trained themselves personally so that they may endure, even for the briefest of time, which is the time we’re assembled for this meeting, the pain of joining with a disconnected soul, like myself. The joining is complicated and many fold for they are gathering information from the collective, from all souls who are joined with me in my soul family that extends millions of years through countless incarnations. I am an old, ancient soul. I’ve been incarnating for eons. I am one of the oldest souls who’s been in this experiment longer than most and has moved from more conscious beings down through the ranks through lifetimes to this form, the human form, which is the lowest sentient form in the pecking order. We humans are the slave species of the galaxy. We are less aware than even the most unconscious of the unconscious beings. And at the same time, the paradox is that we’re more spiritually evolved. Some have greater technology but are less spiritually evolved. It was previously believed that technology and spiritual development would progress at pretty much the same time. They seek to understand this anomaly called human beings. Since we were outside of time and space the gathering lasted hours, weeks, years on some level but only seconds transpired on others. I remained in my bed sleeping, my form totally aware that I was both on Earth sleeping as Janet and at the conference before the masses as Janet Kira Ninmah Lessin, a name that cannot fully define nor explain the complexity of my existence. In my “Galzu” form I am Ki’Ra which is hardly a form at all, but a light being that resides 39 degrees on the right-hand side of God, a being that is all, endless and formless where no sides can be had to reside at. But that’s the best way we of the GodSource level can explain to 3rd dimensional beings. It’s a joke and it’s real all at the same time and when we convey our existence to you, the best we can do between the laughter (for at that level breath is so fast it comes out as hysterical laughter). We do manage to gain control now and again and after some doing, can master communication through your system of in and out breath. But it’s so incredibly slowed down. Your level is slow. The vibratory frequency so painfully dense. We could not imagine actually being on that level. We can only send the slightest thread of our consciousness down to you, a sliver of our essence in order to touch you the best way we can. But even that amount of energy is almost too much for you to take and survive in human form for our vibratory frequency is so high, it would short-circuit your system and literally make your heart stop. Bringing Janet to our zone, the assembly is the best option. So we shall from time to time. We train her to join with us at night and she feels the residual effects of this energy which is healing her human form. Humans are so polluted on all levels, energetically and by chemicals, radiation, waves designed to short circuit and kill continually pouring through your beings. It’s a wonder any of you live at all. That’s another thing that makes humans so amazing is the desire to experience LIFE and remain embodied as long as possible to make the most out of the visit into form. You humans, for the most part, enjoy this thing called life. While we feel the pain your are denying or suppressing so intensely, we couldn’t remain in form for a moment. You are indeed wondrous beings, souls way beyond the average soul so here you are, our heroes, brave pioneers on a huge adventure into consciousness for all of us. And because of what you do, we all benefit and expand awareness, grow more, higher, faster into love and light. Yes, many changes for you personally, Janet Kira and your loved ones and your world, all of humanity began 12/21/12. We will tell you more but it’s almost 1AM and you must sleep. Goodnight for now. We are complete.